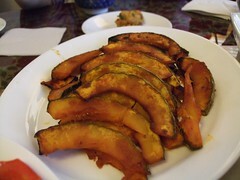 In a large bowl, mix the pumpkin with olive oil, chili sauce, and brown sugar to your taste. Arrange the pumpkin pieces on a cookie sheet. Place in the oven for about 40 minutes.